When Is Yom HaShoah 2020? Yom HaShoah (Yom HaShoa, Yom HaZikaron laShoah ve-laGvura) officially translates to "Remembrance Day for the Holocaust and Heroism", but is often known as "Holocaust Remembrance Day" in English. It is an occasion to commemorate the lives and heroism of the six million Jewish people who died in the Holocaust between 1933 and 1945. Yom HaShoah is on the 27th day of Nisan, the first month of the ecclesiastical year in the Jewish calendar. Yom HaShoah commemorates the lives and heroism of Jewish victims of the Holocaust during World War II. Yom HaShoah is a day of remembrance for the six million Jewish people who died in the Holocaust, and a range of events take place. In Israel, it is a national memorial day. On the evening beforehand, there is a state ceremony at the Holocaust Martyrs' and Heroes Authority, Yad Vashem. At 10am on the day of Yom HaShoah, air-raid sirens are sounded and people stop what they are doing to think of and pay respect to those who died. Places of public entertainment are closed and flags on public buildings are flown at half mast. 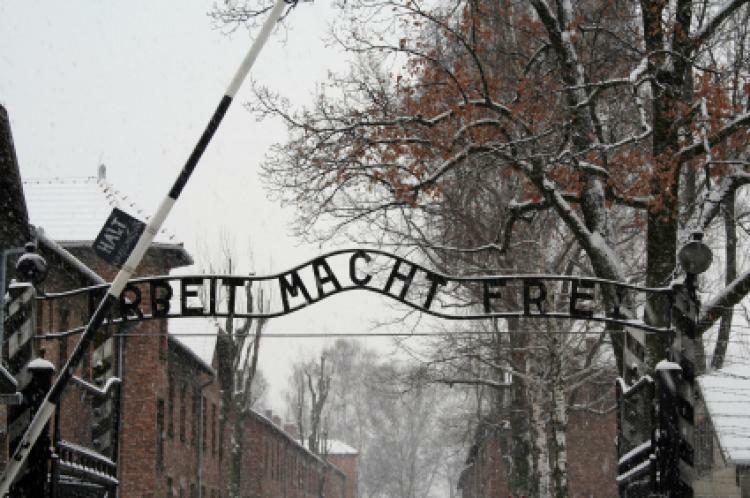 For many students at Jewish schools, a program of education on the Holocaust culminates around Yom HaShoah, with some students attending a memorial service at the site of the Auschwitz-Birkenau concentration camp near Krakow, Poland. The memorial ceremony has become known as "The March of the Living" or "The March of Remembrance and Hope". Other schools and colleges organize lectures by Holocaust scholars, student essay competitions, readings of poetry written during or about the Holocaust, or presentations of music composed during the Holocaust. Attention may also turn to modern-day genocide and ways to prevent it. Outside of Israel, Jewish people hold a range of commemorative events. These include: services, prayers and vigils in synagogues; educational programs in schools or community groups; showings of films about the Holocaust; talks by Holocaust survivors or their descendants; readings of the names of victims of the Holocaust; fasting; and the planting of trees or flowers. The Megillat HaShoah is a scroll and liturgical reading especially for Yom HaShoah. It is also common to light memorial candles and to recite the Kaddish, a prayer for people who died. In the United States, Holocaust Remembrance Day commemorates the lives of those who died as a result of the racial purity measures in German-controlled Europe during World War II and to remind the public of the terrible deeds that can be carried out when bigotry, hatred and indifference are regarded as normal. Observances are lead by the United States Holocaust Memorial Council, which was created by an act of Congress in 1980. Events may be held during a week of Remembrance, which lasts from one Sunday through to the following Sunday and includes Yom HaShoah. Adolf Hitler and the National Socialist German Workers Party, which he led, placed a lot of importance on their ideas of racial hygiene. They believed that it was possible to create a pure race of supreme German people using selective breeding techniques applied in agriculture. They wished to eliminate certain groups of people, who were seen as racially impure, from Germany. These included: Jewish people; the Roma; certain groups of people from Poland and Russia; Jehovah's Witnesses; disabled persons; homosexuals; and Communists. The removal of Jewish people from German society was particularly well-planned and was referred to as the "Final Solution to the Jewish Question". About 11 million people, of whom about six million were Jewish, died mainly in death and concentration camps. It was originally proposed to hold Holocaust Remembrance Day on the 14th day of Nisan, the first month of the ecclesiastical year in the Jewish calendar. This is the anniversary of the ghetto uprising in Warsaw, which occurred on April 19, 1943, in the Gregorian calendar. However, the 14th day of Nisan is the day before the start of Passover (Pesach) and the 27th day was chosen instead. This is eight days before Israel's Independence Day (Yom Ha'atzma'ut). Holocaust Remembrance Day has been observed in Israel since 1959. The date of Yom HaShoah may be moved forward or backwards, so that it does not fall on Friday or Saturday. Yom HaShoah is not universally recognized or observed. Some groups remember the victims of the Holocaust on other days of mourning, many of which predate World War II. Examples are the ninth day of the month of Av, known as Tisha B'Av and which falls in July of August of the Gregorian calendar, and the 10th day of the month of Tevet, known as Asarah b'Tevet and which falls in December or January of the Gregorian calendar. Other groups criticize the day because it does not commemorate the lives of non-Jewish people who died in the Holocaust. A range of people, objects, texts and shapes symbolize the Holocaust. These include: Anne Frank and her diary; the railway cars used to transport people to concentration camps; gates with the words "Arbeit Macht Frei"; clothes worn by prisoners; swastikas; and the yellow stars of David that Jewish people were required to wear on their outer clothing. Symbols of remembrance of the victims of the Holocaust include recitations of transcriptions of lists of names of the victims and eternal flames, such as one that burns in the Hall of Remembrance (Ohel Yizkor) in Yad Vashem, Israel.